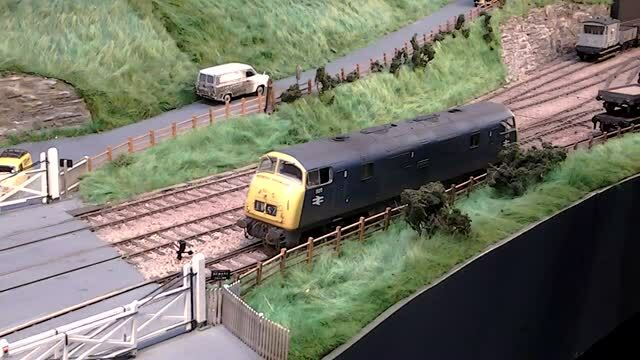 MODELLERS CORNER - A collection of members and friend's models with an inevitable slant towards the Western Region Diesel Hydraulics, Classes 14, 35, 42/43, and 52. A "Just Like The Real Thing" Class 52 Western - D1011 WESTERN THUNDERER in ex.works condition about to be out-shopped in 2015. Bridge Norton is a short demonstration layout built in collaboration with the Huddersfield Railway Modellers group. The "O" Gauge (7mm to the foot) layout aims to provide authentic sights and sounds of the mid-seventies corporate blue era. with a heavy leaning towards Hydraulics and the Western Region. The layout also accommodates various interlopers from time to time, including inter-regional workings, and the odd time-warp visitor (well we need to get Warships and Class 22's in there somehow!). September 2013 edition of the Railway Modeller magazine included an article by WLA working members Ian Allcroft and David Oliver on the history and building of the Bridge Norton layout. The layout was the subject of the wonderful photography of Derek Shore who has kindly agreed for his photographs to be included in this website, and to whom we are most grateful. Steve Speck's lovely DJH/Tower Models D811 DARING on the Bridge. as built by Richard Dockerill. Derek Payne's lovely 7.25" Gauge model of 10000 in early LMS livery. FUND RAISING with a Wizzo or two!